You are here: Home / Latest News / News / 2018 Catalogues Ready to Download! 2018 Catalogues Ready to Download! The 2018 Catalogues Are Here! The new 2018 catalogues have arrived, filled with new products from Little Tikes Commercial Play Structures and Miracle Recreation. 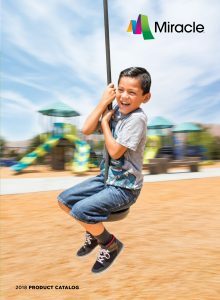 Each catalogue is available in English and French and features exciting solutions for inclusive playgrounds, custom playgrounds and independent play from some of the world’s leading experts. What an incredible time to be a kid… or a parent, or a park planner or a landscape architect! Little Tikes Commercial gives you new ways to open the gateway to the magic of outdoor play. 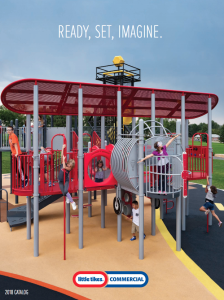 Start your creativity engines with the Concerto™ line of outdoor musical equipment, the hybrid Morphous Slide, NU-edge® nature-inspired play structures, a ground-level Surface Spinner and new activity panels that inspire curiosity, critical thinking and fun. Miracle Recreation brings you more new ways to shape the future of play. Unleash the latest thrilling innovations, like the Extreme Generation adventure playground, the Concerto™ line of outdoor musical equipment, revolutionary new Dome Climbers, the ground-level Inclusive Whirl, the Biba mobile playground app and new play panels that promote interactive, sensory and inclusive play for kids of all abilities. Contact your local Playpower Canada representative to find out more about the latest in play! November 20th is National Child Day! Your Biba playground data report is now available.